It’s the oldest story in the book: Hostile aliens of superior intelligence with more advanced technology travel to Earth to take over the planet, only to be stopped by the resilience and inherent individuality that is humankind. The force best resisting the aliens is always the citizens of the United States of America, of course. Who knows better the feeling of overcoming oppression of a distant, foreign people—“alien”, if you will—trying to make us their slaves and reap the benefits of our land when they are an ocean—or world—away? Those damn British—I mean, aliens—just won’t leave us alone. So, in the rebellious, freedom-loving spirit of the United States’ Independence Day, a.k.a the 4th of July, I wish to celebrate films involving humanity’s independence from hideous, anti-individualist alien races. As far as aggressive alien invasions go, it’s pretty cut and dry—they either want to wipe us out or enslave us. In Roland Emmerich’s Independence Day, the elitist aliens plot to exterminate the human race in order to consume Earth’s natural resources before moving on to the next planet. Although they have superior technology, they haven’t found a way to produce limitless sources of energy… Hmm… Or maybe they just don’t care about being wasteful. In any case, one of those recycling tree huggers, played by Jeff Goldblum, comes up with a way to defeat the aliens by giving their supposedly advanced technology a computer virus. This brings down their spacecrafts’ protective shields, allowing the Americans to easily take them down. You’re welcome, Alpha Centauri system. Sometimes our very biological makeup saves us from evil, consumption-driven aliens. While the true hero in Steven Spielberg’s War of the Worlds are the common viruses that we have become immune to, but remain deathly to the alien race harvesting our blood, Tom Cruise’s character saves the day by preserving his family and becoming a good father—every American’s right. It’s just in our blood, literally. M. Night Shyamalan’s Signs features similar pillaging aliens, only this time they didn’t blow things up; they were also interested in Earth as a resource, so they took preserving it more seriously than the Independence Day aliens. Instead, they excreted a poisonous gas from their wrists that kills off humans without harming the planet. Again, our freedom to keep our homes and live life as we know it is threatened by an ominous, more advanced race of beings. But what humanity lacks in technological advancements, we make up for in primitive, violent instincts. Humans simply use blunt objects to beat down the aliens. (As the alien Kang, or was it Kodos, from The Simpsons said, “The humans won’t stop there. They’ll make bigger boards and bigger nails, and soon, they will make a board with a nail so big, it will destroy them all!”) Then, since the human body is composed of about 60% water and about 70% of the Earth is covered by water, we instinctually knew that H2O would be toxic to the aliens. Thus, our biology and instinctual resourcefulness saves us again, and our freedom is restored—in part by a good ‘ol American baseball bat, no less. Independence Day is wrought with the destruction of symbols of American freedom: the Statue of Liberty, the Washington monument, and the White House (though I suppose that last one is debatable as a symbol of freedom). 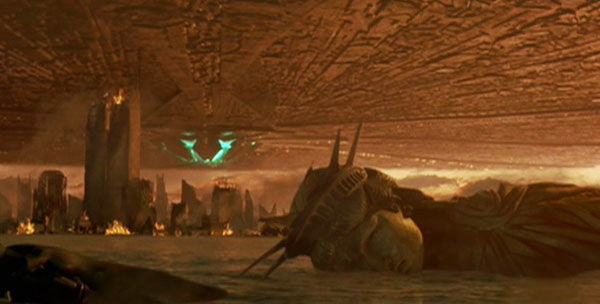 While the image of the massive alien ship hovering over the White House and delivering its devastating energy beam is the most memorable from the movie, the key shots are really those showing the Statue of Liberty before the aliens attack and after as the tall lady lies in ruins. This is a direct warning if there ever was one, and clearly Hollywood knows something that our government isn’t telling us. Before the aliens come, we have freedom; after the aliens come, that freedom is destroyed. But as the final battle against the aliens takes place on the United States’ Independence Day, we’re all reminded of what this country was founded on: liberty and justice for all. We had to fight for it once, and we’ll have to fight for it again, but this time the entire planet will understand what it means to be an American, thanks to American citizens’ inherent drive to be free. Your welcome, Earth. It’s strange how these aliens with superior intelligence are so harsh and brutish. Isn’t superior intelligence supposed to come with respect for all living things? Or, perhaps, they’re the product of a wasteful, hate-mongering civilization that gained its intelligence through destruction. Take the aliens from Mars Attacks! for instance: they don’t seem to have any real motivation for attacking Earth except that they enjoy killing. It’s a good thing that the people of the Earth will almost certainly bond together through the leadership of the United States during the eminent alien invasion. Otherwise, we may end up killing off whole civilizations down the road in order to acquire another planet, or simply for the fun of it. Unfortunately, more often than not, our own government tries to cover up evidence of extraterrestrial life. The Secretary of Defense in Independence Day doesn’t disclose the existence of Area 51 and the secrets it holds until well after the aliens have started showing signs of aggression. In X-Files: Fight the Future, FBI agents Mulder and Scully unravel a complex government conspiracy covering up the existence of a deadly extraterrestrial virus and the presence of aliens on Earth. 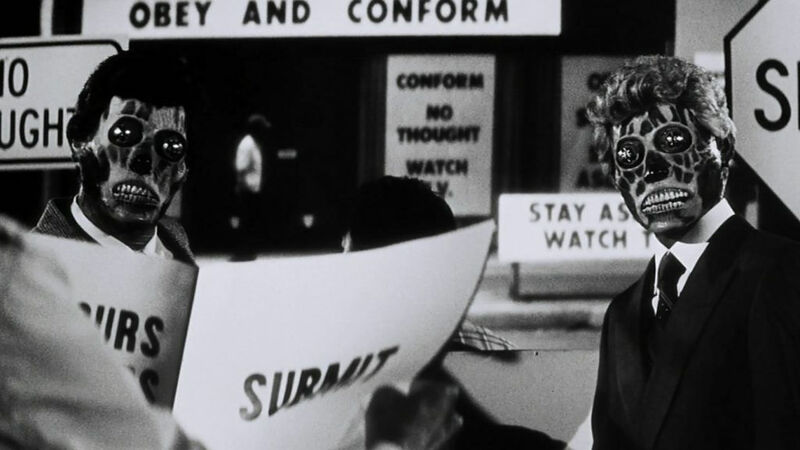 Our world leaders may even conspire with the alien race to enslave humanity, like in John Carpenter’s They Live, where humans are eased into economic slavery through subliminal messages set in place by aliens, who have already colonized our planet, and can only be seen for what they really are by humans wearing special black & white sunglasses. Certain government leaders work with the aliens in order to secure their own comfortable spot in the alien controlled world. It’s well established that our leaders could keep necessary information from us, so one should learn to be aware of the signs. The appearance of crop circles isn’t the result of teenagers with rope and boards like the sheriff leads Mel Gibson’s character to believe in Signs. Nor are they the aftermath of wallabies getting high in poppy fields, as was stated in recent BBC news reports. If someone you know has made claims of being abducted by aliens and football field-sized flying saucers have positioned themselves over the Earth’s largest cities, don’t shake your head in disbelief. When black oil possesses your co-worker and turns them into an alien beast or the rich snobs at the grocery store turn into corpse-like aliens when you wear special sunglasses, you may have an alien invasion on your hands. But there will always be skeptics, even if the aliens are directly overhead in their spaceships. Randy Quaid’s drunken alien abductee character in Independence Day offers his experience as a pilot to the American forces fighting the aliens; when he adds that he was abducted and is looking forward to revenge, the Major requesting volunteers gives a doubtful look to the man standing next to him. This is the same Major who helped execute an escaped alien inside Area 51. Was the possibility of alien abductions really so hard to believe at that point? Don’t get pulled into the skeptics’ trap—if it takes you too long to realize you’ve got a race of aliens looking to conquer your planet, you may not be in the group of survivors. Overall, the message of these films seems to be that we are just one ambitious alien race away from losing our freedom. Our individuality and free-thinking American ways will always prevail. However, we must be vigilant—forget self-serving political leaders, close-minded religious zealots, and terrorist sects who threaten our inalienable rights, and instead watch the skies. Because although our freedoms may be inalienable, that doesn’t mean we won’t have to fight for them—especially against aliens. Keep that in mind this Independence Day, and aim those fireworks a little higher in the name of freedom. Defeating hostile aliens who mean to take over planet Earth: it’s the American way.